Ed Pincent, Magic Mirror. Eibonvale Press, 2010. Pp. 354. ISBN 9780956214799. £12.99. 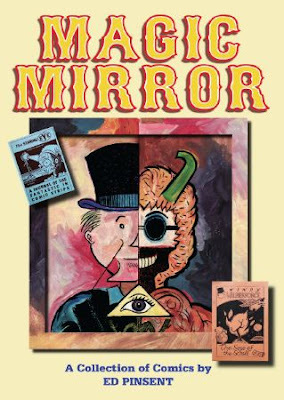 Magic Mirror is a giant compendium of 44 of Ed Pincent’s graphic works from over the years (1982-present), personally selected by the artist and including out-of-print material. The pieces range from one page in length, to the 90+ page story ‘Saga of the Scroll’. The illustrations are entirely black and white. Pincent has been heavily involved in the small-press British comics scene, at one point buying the magazine and distributor Fast Fiction. His work has also been published in Australian magazines such as Escape Magazine, Knockabout Comix and Fox Comics. Citing influences ranging from Calvino and Borges to modern comics, Pincent’s personal style is certainly unique. Somewhat chaotic and appearing to draw heavily on the styles of magic surrealism and slipstream, Magic Mirror is a fun romp through the imagination. From Aesop-styled fables (‘The Ballad of Mr. Ossawary’) to full-out surrealism (‘The Scapegoat’), the range is impressive. The collection comes with a set of author’s notes at the end, talking about each story. While he expresses, in these notes, a wish that the reader will form their own opinions of each comic, I did find the notes to be helpful in gaining a broader understanding of the story underneath. Because some of these stories are so surreal, and so many are open-ended, the notes can be a good closure. The art is black and white line-art, bold and striking. The styles range from grotesque forms that wouldn’t be out of place in a horror story, to a simpler form, reminiscent of Thurber’s cartoon people. The black and white can get a little tiring on the eyes. I would very much like to see Pincent release a color version of this. In ‘The Saga of the Scroll’, a story covering nearly 100 pages, Pincent’s talent has a chance to really display itself. The bizarro aspects of the story certainly do not detract from the deeper mythological elements of it. Pincent has drawn from the Bible, mythology, the tarot deck, history, and half a dozen other influences to craft a story of the victory of Good Over Evil, and a new beginning for the world. This story has been out of print for some time, which is a shame! ‘The Seven Faces of Manley Ville’ is an example of one of the weaker pieces in here. Without a clear plot and an ending best described as abrupt and unexplained, and the telling does not sparkle like so many of the others do. The only real drawback I noticed in this collection is that the stories do run together and the divisions are not always clearly marked. So there are times when one ends, but the beginning of the next is missed. Read carefully, or it might get a little confusing! The individual pieces in Magic Mirror are coherently positioned, adding up to a sort of arcing mythology. Overall, this is an eclectic, enjoyable collection, good for the Pincent enthusiast to add to the collection, or for newer fans to introduce themselves to his work.